How to solve iCloud limitations in transferring music or movies from iPod/iPhone/iPad to iPad mini or from iPad mini to PC, Mac, iTunes or iOS devices? Just get an iPad mini, when I try to transfer my music and movies from my original iPod, iPhone and iPad to the new iPad mini with the help of iCloud, only to find the iCloud only copy music, movie purchases from iTunes and iCloud fail to transfer music or movies I got for free or purchased somewhere other than iTunes. When use iCloud to backup music and movie files from iPad mini to computer, only to find iCloud only supports to transfer files from iPad mini to Mac OS X 10.7.2 "Lion" or later, or from iPad mini to Windows (Windows Vista service pack 2 or later). iCloud only applies to the same Apple ID account, if I try to transfer video or audio files from my friends' iPod, iPhone, iPad, iPad mini to my iPad mini or from my iPad mini to my friends' Mac, PC, iPod, iPad, iPhone or iPad mini, it will ends in fail. There must be Wi-Fi connection and space limitation when use iCloud to transfer movie or music files from iPod/iPhone/iPad to iPad mini or from iPad mini to PC, Mac, iTunes or iOS devices. It can easily transfer music and movies from iPod/iPad/iPhone to iPad mini whatever the music or movie files are purchased from iTunes or not. It can fast copy music and movie files from iPad mini to any version of PC, Mac, iTunes, iPod touch, iPad, iPhone or Apple TV. It helps to transfer purchased video or audio from one iPad mini Apple ID to another. Then it is just easy to share iPad mini purchased media files with family or friends. It does not need Wi-Fi connection and has no space limitation. The following is a step by step guide on how to transfer all kinds of music and movie files from iPod to iPad mini with the help of the powerful iPad mini Converter. It also applies to transfer media files from iPhone, iPad to iPad mini or from iPad mini to PC, Mac, iTunes, iPod, iPad, iPhone. 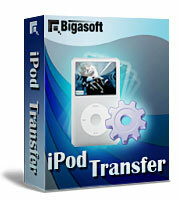 Free download the powerful iPad mini Transfer - Bigasoft iPod Transfer (Mac Version, Windows Version), install and run it. 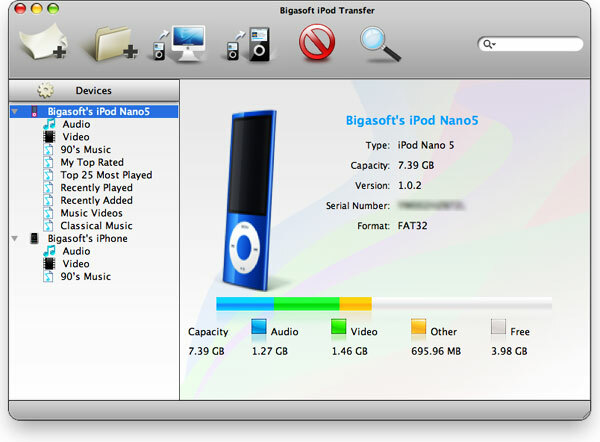 Connect iPod with PC or Mac, iPad mini Transfer will automatically detect the iPod and show you the model and all files of it in details. Go to the proper folder like Audio folder or Video folder in which your desired music or movies are stored to list all audio or video available in the iPod. And then select the music and movies files which you want to transfer from iPod to iPad mini. Click the "Export to Local" button to select the location of output file in the computer, and then click "OK" button, the iPad mini Transfer will automatically start and finish transferring files from iPod to Mac or PC. After finish transferring music or movies from iPod to computer, simply connect your iPad mini with computer and start iTunes to sync the transferred music and movies files from the computer to iPad mini.